Founder of the "Just Stick It" Knife Club. "I'm 46, been throwing knives on and off since about 1957. One thing I gotta say is when they made up the phrase practice makes perfect they had ta been talkin' bout throwin knives! Anyone who wants to get together and throw just drop me an email!" "I threw my first knife around 1976 at the ripe old age of 4. Nope, not kidding." "I was born in 1983 and started throwing at the age of 3!" "I'm 18 months old in this pic and already stuck 2 knives! My Dad started at 4 so I'm gonna get a jump on him! If I'm anything like my Dad or Grandpa... lookout!!! :-) "
"I'm 13 years old and I have been throwing for at least a year now and I am pretty good at it. Even though I have only one knife." "I picked up thrown weapons after I joined the SCA. I have been throwing since 2000 and have been attempting to run a regularly scheduled practice in my backyard during warm weather. Axe, knife and spear throwing is the majority of my practicing, but I just picked up a Staff-Sling and Atlatl to add to my practice time." "As a kid I aways liked throwing knifes, spears, hatchets, saw blades etc. Just about anything that would stick in wood." I would like to hear more about any local throwers around Helena, Ohio." "My grandson and I have been throwing since Oct 2008 at least 4 or more times per week. We are getting pretty good at sticking and it sure is alot more enjoyable when you start sticking more then missing. I have made all of our knives. Mine are 14" long, center balance and weigh 16 oz, they throw great." "I have been throwing with my Grandfather since Oct 2008 at least 4 or more times per week. We are getting pretty good at sticking and it sure is alot more enjoyable when you start sticking more then missing. My knives are bowies, are 14" long and also weigh 16 oz." "I have been throwing knives since my childhood. I was inspired by watching scenes from movies and TV shows. 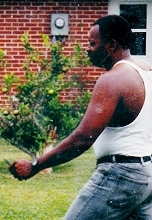 I started throwing pocket knives using a half spin during those early days. Fast forwarding I have a large collection of all sizes and types of throwers. Most often I use the one and one half spin technique with medium size knives. I use other methods as well depending on the size and weight of the knife. Currently I'm developing the no spin."